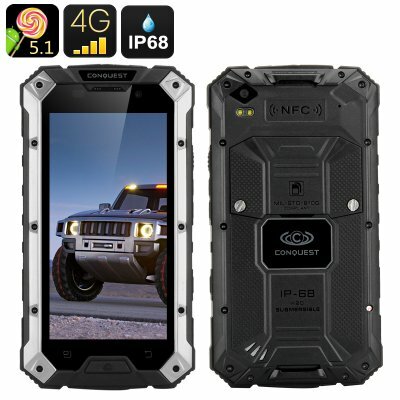 Successfully Added Conquest S6 Rugged Smartphone - IP68, 5 Inch HD Screen, 4G, Dual SIM Android 5.1, 3GB RAM, NFC (Silver Black) to your Shopping Cart. The Conquest S6 is a sturdy rugged Smartphone meant for outdoor adventures and reliable service. With a 5 inch HD screen, IP68 waterproof rating, 3GB of RAM and a 4000mAh battery, you will have everything you need compactly featured in one stylish rugged Smartphone. While most rugged Smartphone would leave you looking at a small screen, the Conquest S6 offers a 5 inch HD display —a great platform for watching movies, playing games and browsing the web. With Android 5.1, you have an intuitive interface at your fingertips and access to the Play Store for more fun games, cool apps and useful tools. The Conquest S6 comes with OTG for quick wireless software upgrades and NFC for efficient file exchange on the go. With 32GB of internal memory and up to 128GB supported externally, you will have lots of storage space. Featuring IP68 waterproof rating, the Smartphone can be submerged in water for up to 1 meter for a period of up to 30 minutes. It is also shockproof, dustproof and has its 5 inch screen well-protected by Corning Gorilla Glass with 9H hardness rating. With a 4000mAh battery the phone will give you up to 7 hours of continuous talk time and about 350 hours on standby. With 4G connectivity on two SIM cards, the Conquest S6 rigged Smartphone truly has it all.